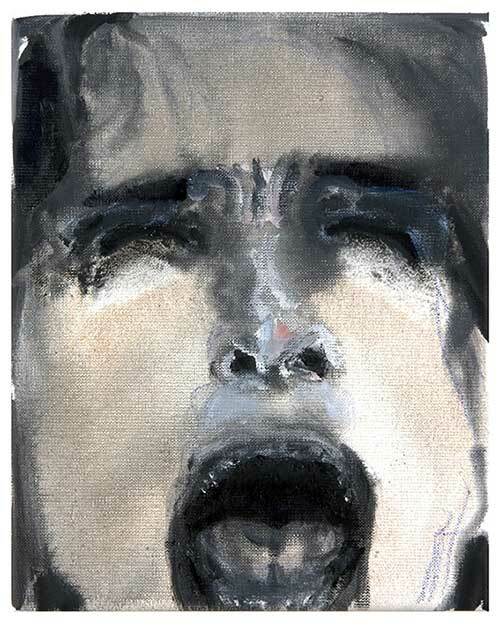 Marlene Dumas (1953) grew up with her two older brothers in Jacobsdal, her father’s winery in Kuilsrivier, South Africa. With Afrikaans as her mother tongue she went to the English-language University of Cape Town in1972. There she obtained a Bachelor’s Degree in Fine Arts in 1975. With a two-year scholarship, she opted to come to Europe and more specifically to the Netherlands because of the language kinship. As well as visual art, language is an important means of expression for Dumas. She gives her exhibitions and individual works striking titles, writes texts about her paintings and makes commentaries on her own pieces. These texts are collected in the publication, Sweet Nothings (1998). From the mid-nineties, Dumas’ work featured in exhibitions of art from the Netherlands, such as Du concept à l'image (Paris, 1994). She also participated in international, interdisciplinary projects including The 21st Century (Basel, 1993), with Damien Hirst, Roni Horn and others, and the Carnegie International (Pittsburgh, 1995). In 1996, her sparring partners at the Hirshhorn Museum in Washington DC included Mike Kelley, Thomas Schütte, Robert Gober and Rachel Whiteread. The exhibition was entitled, Distemper: Dissonant Themes in the Art of the 1990s. In 1993, Zeno X Gallery, Antwerp, staged Dumas’ show, Give the People What They Want. The works in this exhibition then went on to become part of the ‘Der Spiegel zerbrochene’, Positionen zur Malerei (1993), curated by Kaspar König and H.U. Obrist. Other participating artists included Luc Tuymans and Gerhard Richter. Other important exhibitions devoted to painting in which Dumas was represented included Trouble Spot: Painting (1999), Painting at the Edge of the World (2001) and The Painting of Modern Life (2007). Her work has also featured in exhibitions with a focus on Africa, such as the Africus Biennale in Johannesburg (1995) and in Africa Remix (2004-2006). that I could not have it both ways. I don’t want it both ways. I want it more ways. Marlene Dumas has received several awards and honours. In 1989, she received the Sandberg Prize and in 1998, specifically for her drawings, the David Roell Prize/Prince Bernhard Cultural Prize for Visual Arts. In 1998 she received the Coutts Contemporary Art Award. In 2010, she received an Honorary Doctorate from the Faculty of Humanities, Rhodes University, Grahamstown, South Africa. In 2011 in Stockholm, she was awarded the Rolf Shock Prize in the Visual Arts, the stepsibling of the Nobel Prize. Her entire oeuvre is this year awarded the Dutch State Prize for the Arts, the Johannes Vermeer Award 2012.